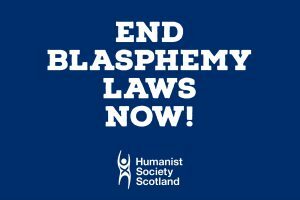 Last week when talking to friends about the campaign work Humanist Society Scotland, they expressed surprise that Scotland still has a common law offence against Blasphemy. To be fair, it is a surprise to most people in Scotland given the fact it is never enforced and little spoken of. Most people in modern Scotland chuckle or roll their eyes at the thought of Blasphemy enforcement perhaps thinking of the lampooning of overly officious authorities in Monty Python’s Life of Brian or 80’s cult classic film Uncle Buck. Often that leads to a complacent attitude, if a law has fallen into disuse is it something to even bother about? Surely it is just an academic effort that in reality has little to no impact. Some would even argue that laws which are in disuse no longer have a legal standing and are, perhaps by accident rather than by design, no longer enforceable. Firstly, however this assumption that a so called “dead letter law” cannot be reactivated has been shown not to be the case. In fact the law on Blasphemy itself (in England and Wales) was assumed to be such an example of a dead letter law before being reused. In 1949 Lord Denning stated in the House of Lords that Blasphemy was no longer a danger to the fabric of society that needed the state to intervene and that the law had fallen out of use. Despite this assessment fast forward to 1977 and the publishers of the poem – “The Love That Dares to Speak Its Name” by James Kirkup – found themselves in hot water over Blasphemy. 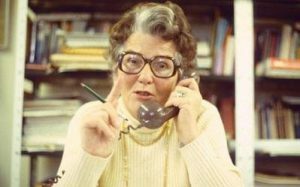 The editor of Gay News, faced a private prosecution for Blasphemy orchestrated by social conservative censor campaigner Mary Whitehouse. The editor – Denis Lemon – was convicted, fined and given a suspended prison sentence for the publishing of this ‘Blasphemous’ material. The case had a high profile at the time with Gay News fundraising to fund appeals against the conviction. This included financial support from Monty Python who themselves would later face accusations and protests against ‘Blasphemy’ over their film Monty Python’s Life of Brian. So despite a law being considered by the holders of the highest law offices to be out of use, this still didn’t stop a future successful prosecution attempt. 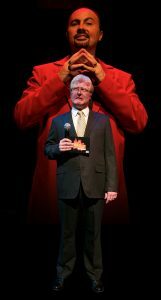 There have also been other failed attempts to bring charges for Blasphemy against individuals since the Whitehouse Vs Lemon case, including one against the makers and writers of Jerry Springer: The Opera but none have been successful. After a campaign, which included our friends Humanists UK, the law in England and Wales was eventually put to bed in 2008 with the official striking out of Blasphemy by Parliament. In Scotland, however, no such official definitive action has been taken. 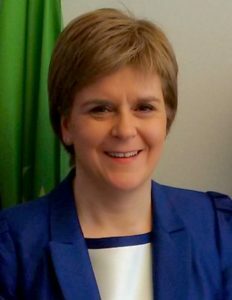 Correspondence with the Cabinet Secretary for Justice, revealed by Humanist Society Scotland in July 2017, shows the Scottish Government take the assumption that Human Rights law trumps any common law offence. 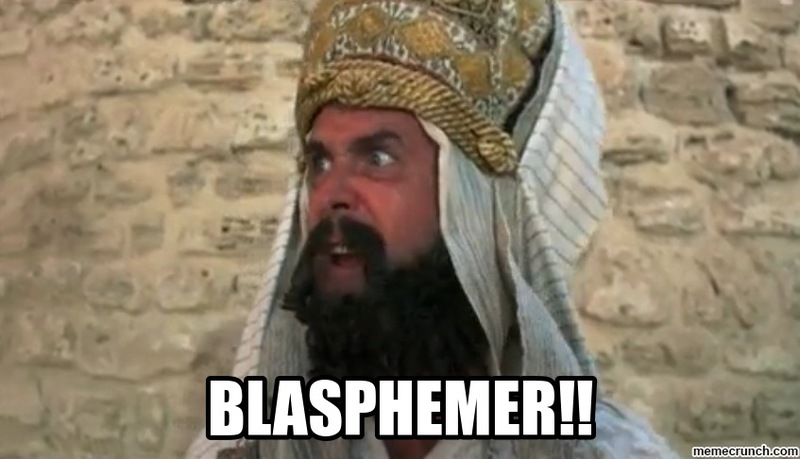 A Blasphemy charge, they say, would fall foul of a Human Rights test before it even began. However in another legal case that touches on the issue of Blasphemy, Wingrove Vs UK in 1996, the courts decided that even within a Human Rights framework, the state were within their rights to restrict blasphemous content within its allowed margin of appreciation. Therefore the assumption that Scotland’s Blasphemy Law is gone for good, could potentially be called into question by courts in the future. There is however, another, more pressing reason that the Humanist Society campaign to remove Scotland’s Blasphemy law. Across the world people still today face live and restrictive Blasphemy laws. These are not only used to restrict offence to a deity (in the traditional definition of Blasphemy) but also to threaten political campaigners in a variety of progressive movements including women’s rights, challenging ethnic discrimination and ending legal restrictions on homosexuality. It is in these cases of persecution and restriction of rights that Scotland does and should have a role to play. 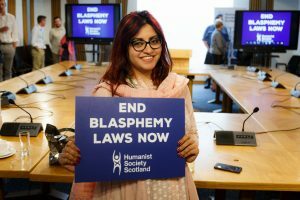 Two weeks ago I watched Gulalai Ismail, from International Humanist and Ethical Union, give an impassioned plea in the Scottish Parliament for Scotland to scrap it’s old and outdated Blasphemy law. Gulalai gave her personal experience from Pakistan of how both blasphemy laws and incited violent mobs are used to restrict freedom of speech and even murder individuals who dare to offer a different view of the world to the status quo. She spoke on how she herself had faced accusations of Blasphemy for simply campaigning for respect of women’s rights. 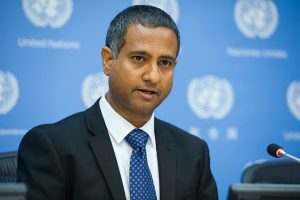 Campaigners such as the International Humanist and Ethical Union (of which Humanist Society Scotland is a member), report that the existence of dead letter Blasphemy laws in Europe, makes it more difficult to argue for the repeal of active Blasphemy laws at the United Nations and other international bodies. States that actively abuse Human Rights through Blasphemy laws take great glee in pointing out the “liberal elite West” have Blasphemy laws of their own as if to undermine the plea with regard to Human Rights. 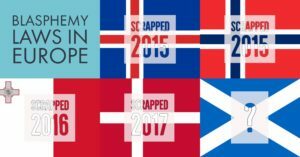 Other countries have grasped this challenge with Denmark, Malta, Iceland and Norway all taking action to scrap their Blasphemy laws as well as the earlier example of England and Wales. To have progressive states like Scotland, New Zealand and Ireland thrown back as an exemplars of places with Blasphemy law mean leaders ignore or accept quietly that hypocrisy. To stand for Human Rights means standing for Human Rights both on your doorstep, but out in the rest of the world. Scotland, your failure to deal with this archaic and outdated Blasphemy law is having an impact elsewhere and by denying that fact you are tacitly an accessory to persecution. Earlier this year the First Minister Nicola Sturgeon said in regard to a trip to China where she raised Human Rights abuses “I bow to nobody in my determination to play my part internationally in promoting human rights across the world.” Clearly a Government, and a leadership, so committed to protecting and furthering Human Rights at home and abroad can take, what is in effect, one very small step in scrapping the Scottish Blasphemy law. Forthcoming legislation that modifies Scotland’s laws on Hate Crime is an ideal and timely opportunity to put to bed once and for all Scotland’s historic common law offence on Blasphemy. It is more than just legal tinkering but an opportunity to stand up and be counted in support of people jailed, lashed and put on death row for Blasphemy elsewhere in the world. It is always too easy, not just for politicians but for everyone, to condemn but not take any action on rights abuses that don’t impact on them. To us it would seem a small insignificant move but to others it offers hope and knowledge that we will stand by them and support the end of Blasphemy laws not just in Scotland but around the world.